I did, I did, I did thee an ophthalmologist! It wasn’t without reason that I haven’t been to the ophthalmologist in three years. After a few visits, my last eye doctor and I were no longer able to see…um, eye to eye. I remember the day well. It was a sunny day in south Florida (like so many of them), and I had left work early to go to my annual eye exam. I went through the usual steps of signing in, getting my vision screening, eyes dilated, and squinting at the TV to try and read the news ticker with blurry vision. Always a fun game in the eye doctor waiting room. Finally, I went back to see the doctor, and he proceeded to look in my eyes with his little bright lights and explain to me how us people with diabetes just don’t take care of ourselves and it’s our fault for being in the shape we’re in. He continued to tell me that I had spots on the backs of my eyes from diabetes retinopathy that were leaking and cataracts. I was 28 years old, and had lived with diabetes for 26 of them. Unlike John Boehner, it’s hard to make me cry. I have a tendency to throw up walls and block things out. But that appointment managed to get inside my walls, and I broke down. The technician couldn’t get a picture of my eyeball to put in my file because of the tears. That visit was a disaster, I was a failure, and I had just been told that my failure was nobody’s fault but my own. No wonder PWD’s struggle with guilt. The sun was bright that day, so I sat down in the lobby after my appointment to wait for the sun to go down a bit more before driving home with my eyes dilated. That’s when I got to thinking. My A1C was in the 6 percentile. I was 175 pounds and put over 200 miles a week on my bicycle. I didn’t smoke, and only drank on rare occasions. I kept regular appointments with my endo, and wore my lab numbers with pride. How dare that doctor blame me for my diabetes! Which was about the time I marched back to the exam rooms and set the record straight for him in front of his staff. So three years passed without my going to another eye doctor appointment. At a recent diabetes meet-up, a friend recommended me to her eye doctor. Seeing as how my good glasses are broken now and I’m wandering around in my backups with their scratched lenses and all their glory, it was time to try it again, so I bit the bullet and made the appointment. Today was a completely different experience, and for that I am so thankful. My vision screening went well (20/50 in both eyes without glasses, 20/20 with). Everyone I met at the doctor’s office was very polite, patient, and respectful. They answered my librarian brain fueled list of questions without showing any signs of annoyance or judgment. My new eye doctor understood the differences between the various types of diabetes, and was very encouraging. He did find a couple very minor spots on both eyes, but no leaks and no cataracts, and he said that I have nothing at all to be concerned about, especially not for someone who has had diabetes for 29 years and taken care of it like I have. 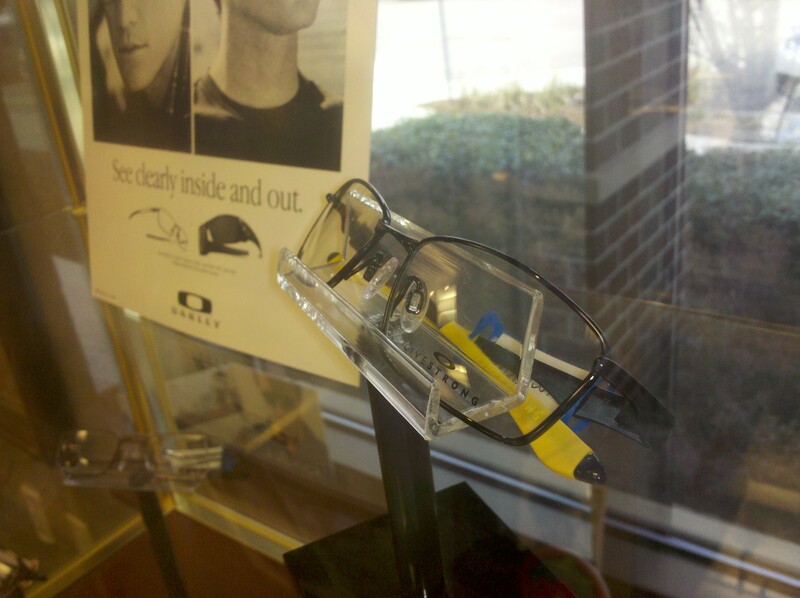 Oakley Black Livestrong glasses...yes please! You did great and I am so proud of you! It’s hard after having a bad experience to go back–hello, that’s why so many people hate the dentist. Now get those new specs so you can be spottin’ dimes from 400 feet! Great Job taking care of yourself. It’s not easy at all. I get that. You should just splurge and get those glasses now!